"Chevy Guy" Rikk Wilde became a viral sensation bumbling his way through a World Series presentation Wednesday night. Giants' pitcher Madison Bumgarner may have gotten the trophy, but the true MVP of the World Series Wednesday night was Rikk Wilde. 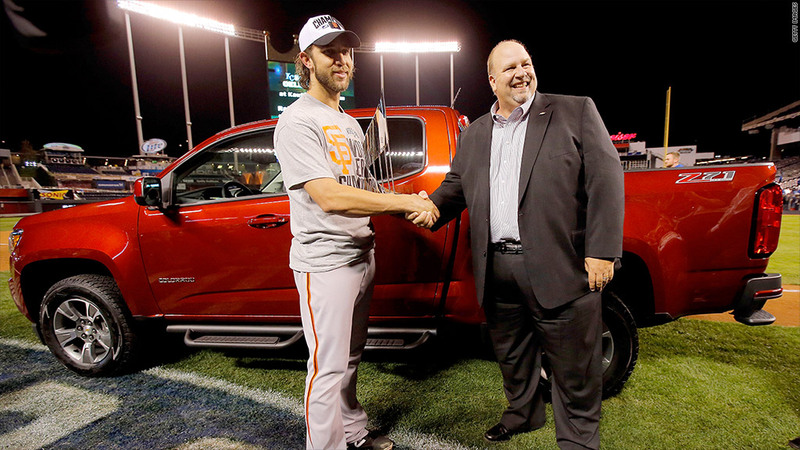 Wilde, or as the Internet has dubbed him "Chevy Guy" was given the duty of presenting Bumgarner with the keys to a new Chevy Colorado at the end of Wednesday night's World Series game 7. Chevrolet is an official sponsor of Major League Baseball and traditionally the World Series MVP is presented with a car by a spokesman from the company. It's usually a cut and dry presentation, but Wilde, a Chevy regional manager, was visually nervous which caused him to bumble the lines that he was obviously reading from prepared notecards. "It combines class winning, um, leading... 'ya know, technology and stuff," Wilde said about the Chevy Colorado during Fox's post game show. The phrase "technology and stuff" has since taken on a life on its own instantly becoming a hash-tag. Not to mention, Wilde getting bestowed with the moniker "Chevy Guy." You would think it an embarrassing situation for Chevy's parent company, GM (GM), but the company is having fun with it. 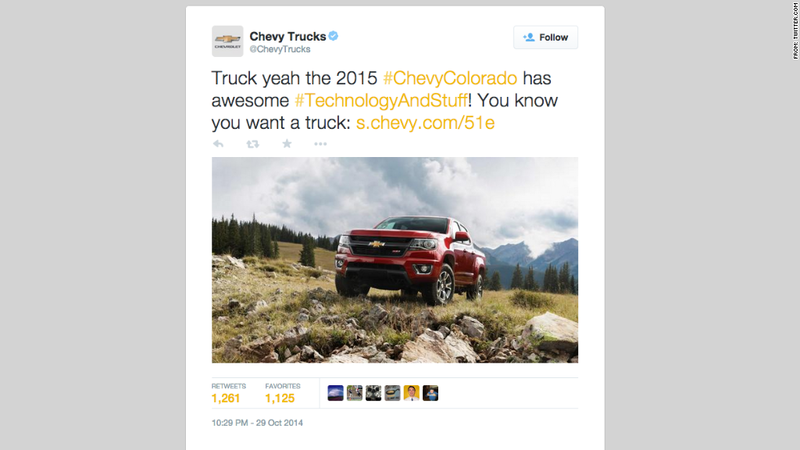 Chevy even sent out tweets early Thursday morning with the viral catch phrase attached. "A lifelong Kansas City Royal fan, Rikk was still a little emotional over the outcome of a tremendous seven game series," GM said in a statement. "We believe baseball fans in Kansas City and elsewhere can relate with Rikk's authentic emotions." Regardless of the awkward presentation, Chevy has gained some pretty good social publicity from Wilde, which for the car company is pretty good stuff indeed.